Children have designed figures of Stephen Fry, Lord Nelson and Edith Cavell, which have been unveiled in Norwich. Figures have been unveiled in Norwich of Stephen Fry, Lord Nelson and Edith Cavell, designed by children. Figures designed by children – of Stephen Fry, Lord Nelson and Edith Cavell – have been unveiled in Norwich. 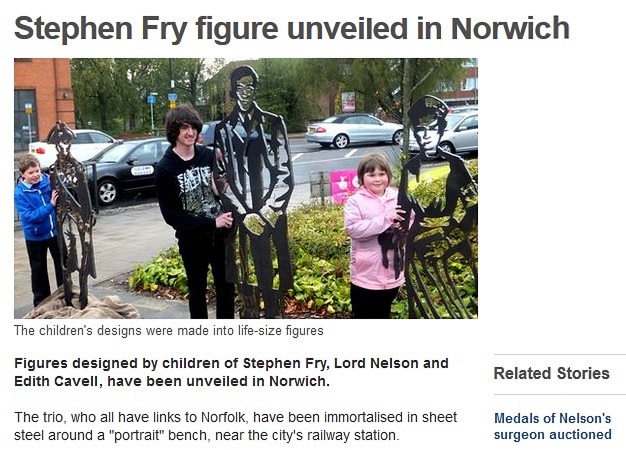 Figures unveiled in Norwich – of Stephen Fry, Lord Nelson and Edith Cavell – have been designed by children. All of them forbear from any imputations of inter-generational immorality and, above all, any disgraceful suggestion that Stephen Fry might be a heterosexual. « Is that a piece of the peace, or the whole peace?